Sorry, item is not available in this country. 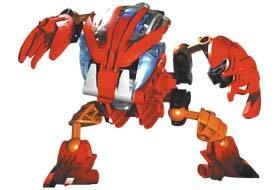 The Tahnok are the most aggressive and destructive of all the Bohrok swarms! They use their mastery of fire to burn and melt whatever's in their way. Even with their krana removed, Tahnok are hard to tame. Can the Toa stop them before they turn Mata Nui into ash? LEGO, LEGOLAND, LEGO TECHNIC, ALPHA TEAM, BELVILLE, BIONICLE, BLOCK-O-DILE, CLIKITS, DUPLO, MINDSTORMS, QUATRO, ROBOTICS INVENTION SYSTEM, SPYBOTICS, the LEGO and LEGOLAND logos are trademarks of the LEGO Group.